Falcon 9 rocket launches could soon become a familiar sight in southern Texas. SpaceX, which is based in Hawthorne, California, has been buying up land near Boca Chica Beach in preparation to build a seaside spaceport in Brownsville, Texas, where commercial satellites will soar over the Gulf of Mexico and into orbit. "SpaceX is excited to expand our work in Texas with the world's first commercial launch complex designed specifically for orbital missions," SpaceX CEO Elon Musk said in a statement. Musk thanked local and state officials, including Governor Rick Perry for their efforts "to make this vision a reality." Perry announced this week that the Texas Enterprise Fund would offer $2.3 million to bring SpaceX's launch site to Cameron County. Under the Texas incentive plan, SpaceX will also collect $13 million from the Spaceport Trust Fund to the Cameron County Spaceport Development Corp. According to Perry's office, the new Texas spaceport would mark an $85 million investment in the local economy and it promises to create 300 jobs. "Texas has been on the forefront of our nation's space exploration efforts for decades, so it is fitting that SpaceX has chosen our state as they expand the frontiers of commercial space flight," Perry said in a statement. "In addition to growing the aerospace industry in Texas, SpaceX's facility will provide myriad opportunities for STEM [science, technology, engineering and math] education in South Texas, and inspire a new generation of Texas engineers and innovators." In an appearance at the National Press Club in April, Musk said SpaceX was just waiting on environmental approvals to go ahead with developing the Brownsville launch pad. "We expect to get those soon, and we'll probably have that site active in a couple of years," Musk told reporters at the time. This map from the FAA Record of Decision approving SpaceX's spaceport plans shows the location of the proposed private launch site in Cameron County, Texas. 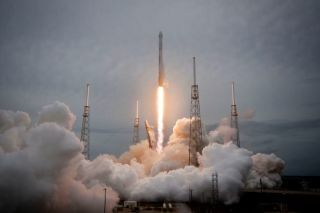 Then in July, the Federal Aviation Administration gave approval for SpaceX to go ahead with its private spaceport plans after the agency finished a review of safety and environmental concerns. The decision clears the way for SpaceX to get licenses and permits to use the site to launch Falcon 9 and Falcon Heavy vehicles on orbital flights and to launch a variety of reusable and experimental vehicles for suborbital flights, according to the FAA. Though SpaceX has lucrative government contracts — including a $1.6 billion contract with NASA to carry out 12 resupply missions to the International Space Station — the facility at Brownsville will be dedicated to launching commercial satellites. Once the Brownsville facility is operational, SpaceX expects to launch up to 12 missions from the site per year. SpaceX is already doing business elsewhere in Texas. The company has a rocket development facility in McGregor, Texas, near Waco, where it has been performing test flights with its rocket prototypes. Michael Blades, an aerospace analyst for Frost & Sullivan said Texas is "a very desirable location for a new space launch facility." "Being one of the southernmost portions of the U.S., South Texas is closer to the equator, which means less rocket power is required to reach escape velocity, or a given amount of rocket power can transport larger payloads into space," Blades said in a statement. "As SpaceX is vying to become the preeminent commercial space launch company, they must offer multiple launch options while keeping costs down."